LucyFanForever had the most liked content! 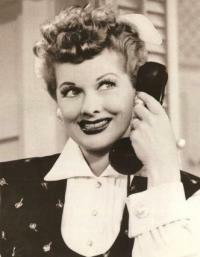 I like watching I Love Lucy specifically, and Audrey Hepburn movies. I also enjoy photography. LucyFanForever replied to Brock's topic in Lucy Loungers Are Fabulous! ETHEL: What are you writing about? LUCY: I'm writing a novel about things I know. ETHEL: That won't be a novel, that'll be a short story. Is it ok if I post one? LOL. . I love the feathery dress from the Dancing Star in the book. . It's LIGHT PINK!!!!!!!!!!! Lucy: I want the names to be unique and euphonious. Ricky: Ok, Unique if its a boy, and Euphonious if its a girl. :'( You don't love little Robert or Madelyn! Lucy: I want the names to be unique and euphonius. Well, I know its probably cheating, but somebody went and uploaded all the images online! So I went and saved them onto my device, printed them out, and laminated the dolls. Yeah, it isn't the real book, but still........cheaper, anyways! LucyFanForever replied to Mot Morenzi's topic in Lucy Loungers Are Fabulous! Are you talking about these paper dolls? My I Love Lucy prop came!!! LUCY: "Dear Lucy, how are you and Mickey? I couldn't find your address, so I am sending this to Ethel Mertz. If you get it, please let me know as I have made a copy of it." Well, that's thinking. "The copy is enclosed. As a matter of fact, if you have read this far, you must have received this letter, so tear up the copy and thank Ethel for me." Thank you! I'm not sure, but I think I might've seen it on that shelf too.......or maybe on the stove or the breakfast counter during some scenes? I'm not really sure, but if I see it somewhere for sure, I'll say so! Also, noticed the glass on the show again yesterday: In "Equal Rights", while they're all out for dinner, the glasses are on the table. . Of course, I have no way of knowing if one of them is mine, or even which one, but anyway. LOL!! Hmmm, that might be it. My family's TV isn't exactly tiny, but it isn't any big television either. . Maybe I just don't see the difference cause I don't pay much attention to such things. Lollol.